“Uttarakhand’s Auli is India’s Switzerland”, said a travel catalogue placed on our office desk. Soon, our inner wanderlust sprang to life and the process of knowing everything about a place that is famed for its stunning landscapes and vistas began in full force. It’s true that Auli is a meadow that retains its beauty throughout the year but it’s also true that it has a different aura in winters. Perfectly sewn in its best winter attire, it is couture for a skier. 1. Auli lies in the Himalayan Mountains of Chamoli District in Uttarakhand. 2. Located at an elevation of 2,500 metres (8,200 ft) to 3,050 metres (10,010 ft) above sea level, Auli lies on the way to Badrinath, a famed Hindu pilgrimage destination. 3. It overlooks the Nanda Devi, second highest mountain in India. 4. The world’s highest man-made lake is at Auli, called the ‘Auli Artificial Lake’. 5. Auli has hosted the 1st South Asian Winter Games in 2011 for the events of Skiing and Snowboarding. 6. To reach Auli, you have to first get to Joshimath. From Joshimath you can either get in a 10 km car ride to Auli or opt for the Auli ropeway (a cable car that is stretched over 4 km taking you from Joshimath to Auli). The high point of anyone’s trip to Auli is undoubtedly Skiing. Auli has about 5 kms of glittering white snow slopes, suitable for professional skiers and novices alike. The slopes here are flanked by conifer and oak trees, covered with snow in abundance and blessed with the best views of peaks soaring well over 23,000 ft.
One fortunate aspect about skiing in Auli is that even if you haven’t tried your hand at skiing before, you can come and take your first baby steps here because there are trained instructors available on site, ready to guide you for a fee on a per day basis if you don’t want to enrol for complete ski courses. You also don’t have to worry about how to get back up after gliding downwards to the bottom of the slopes because there are ski-lift (for baby slopes) and chair-lift (for advanced slopes) to carry you back to the top of the mountain. Just be prepared to carry plenty of warm clothing to survive the notorious Auli weather and just have fun. There are many certificate and non-certificate skiing courses available by private tour operators, freelance instructors as well as the Government of Uttarakhand namely, GMVN (Garhwal Mandal Vikas Nigam Ltd). GMVN is responsible for the maintenance of all ski facilities in Auli. GMVN conducts 7 day non-certificate and 14 day certificate skiing courses every year from Jan-March. If you want to learn skiing from freelance instructors you will have to pay the equipment and service charge per day. However, if you enrol for a course with GMVN, the fees will include facilities like boarding, lodging, ski equipment, lift and training. If you enrol with private operators also, the charge will cover similar provision. Just make sure you check the facilities available under the fee charged. Skiing is a wonderful activity and after almost a week of practicing, you will be confident enough to manoeuvre down the slopes and perform parallel turns effortlessly. Snowboarding, a sport that holds high chances to be your next favourite sport can be done here in Auli. You get to hop on a snowboard and experience the thrill of sliding downhill on Auli’s bountiful slopes. Just like skiing, there are also snowboarding courses available in Auli. The facilities for both the sports are very similar. Being bountiful in terms of landscape, consistency of snow, and good quality coaching, Auli is the perfect place to try your hand at Snowboarding. For people who are not inclined towards winter sports or much activity, this is one saving grace. Auli is known for its stunning scenery and breathtaking mountain panoramas. It overlooks Himalayan worthies like - Nanda Devi (7816 m), Kamet (7756 m), Mana Parbat (6,794) and Dronagiri (7066 m) among other peaks. If you visit Auli in winters, the entire landscape will be gloriously painted white with glistening peaks all around you. Don’t forget to take a good camera and capture great shots because this place is all a photographer has ever wanted for his lens. There are two options to reach Auli from Joshimath, the first one is to get on a 10 km car ride (if there is no heavy snowfall blocking the road), the second and the most thrilling option is to get on the Ropeway. The charge for the ropeway (as of 2017) is Rs.750 (return ticket), which is higher than what a car ride would cost you (considering at least 4 to 5 will share the fare). But, we recommend you take the ropeway at least once on your trip. Known as the world’s highest man-made lake, the Auli Artificial Lake is located next to the private hotel named The Cliff Top Club. As we all know Auli hosts a number of winter games and competitions, which means the consistency of snow is very important here. This lake was built to produce quality powder snow in case there is lesser snowfall. This enables Auli to conduct its winter games even when the weather gods are playing spoilsport. The views that each of these trails provide are indescribable. However, you have to choose the trekking trail that suits you the best, based on your previous trekking experience and stamina. Auli can get dreadfully cold in the winters, which is when you will be likely to visit. Going in to learn a winter sport without a basic level of fitness or protective clothing is not helpful. So, make sure you are prepared both physically as well as in terms of dressing up to brace the cold Auli weather. Maintaining a minimum level of fitness is required to avoid injuries while skiing. It doesn’t ask for much. Just start a month prior. Either hit the gym to strengthen your abs, arms, calves and quadriceps. Or just start running for 25-30 minutes thrice a week. When the minimal training part of your body is done, you have to take precautions to protect it in the cold Auli weather. Make sure you dress in layers. Your body is best kept warm when you dress in layers. A few must haves for this trip are: A windproof/down jacket, thermal inners, muffler, woollen gloves to wear inside ski mittens, a cap that covers your ears, socks, prescribed medicines that you may require, sunglasses with extra protection, generous amounts of sunblock and high SPF lip balm. Also known as Gorson Bugyal, this high altitude meadow lies at the top end of Auli’s ski slopes. It’s a 3 km hike from Auli that you can easily accomplish in the day. While this hike is a top pick for hikers in summers, it can be done in winters too. The view of the Nanda Devi and other Himalayan peaks that you get at this specific point is widely celebrated. Legend has it that this place is where Lord Hanumana rested on his way while getting Sanjeevani from the mountains to cure Lord Laxmana. You will easily spot the temple in Auli, it lies near the GMVN resort. As interesting as the story attached to the temple is, the view from the temple is extremely serene. Take a look for yourself. 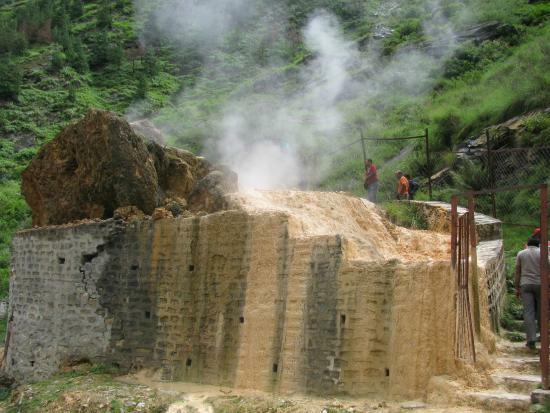 You can drive down and visit The hot water springs of Tapovan (14 km from Joshimath & 32 km from Auli). It is a major tourist attraction of Tapovan, may be because it is believed that the water from these hot springs have medicinal properties. The Kuari pass trek is an incomparable trek. The views from the Kuari Pass are often quoted as the best in the Indian Himalayas and it’s not difficult to understand why. Firstly, it gives you one of the closest views of the 2nd highest mountain of India, the Nanda Devi. Secondly, it is flanked on all sides by Himalayan worthies like the Chaukhamba Range, summits of Mana, Kamet, Dronagiri, Changabang, Abi Gamin amidst others. Badrinath is the most important site of the four sites of the Char Dham Pilgrimage. The great part about visiting Auli is that it lies on the way to Badrinath. You can visit the town as well as the Badrinath temple, a temple dedicated to Lord Vishnu. It is the main attraction of the town and is a 55 km drive from Auli. Although, Rishikesh is 263 km from Auli, most people start their Auli trip from here so that they get to indulge in the most celebrated activities of River rafting and Bungee jumping in Rishikesh. You can start 2 - 3 days earlier and club Rishikesh with your Auli itinerary. Auli is a 10 km drive from Joshimath. So you have to reach Joshimath first. There are State transport and Union buses going regularly between Joshimath and Rishikesh. They also operate between Joshimath and Rishikesh (254 km), Haridwar (273 km), Dehradun (294 km) and Delhi (495 km). From Joshimath you can either take a bus, taxi or the ropeway to Auli. Auli has established itself as India's premium ski resort. It's the perfect season to put on your skiing clothes and hit the rich slopes of Auli. If you are one of the adventurous folks planning to seek a great snow-filled experience in Auli this season, then we hope this page is helpful to you. Also write to us about your favourite adventure sports destinations and travel stories. We would love to listen to your inner wanderlust. Travel more. Explore more. Because Experience is the best thing you can flaunt.